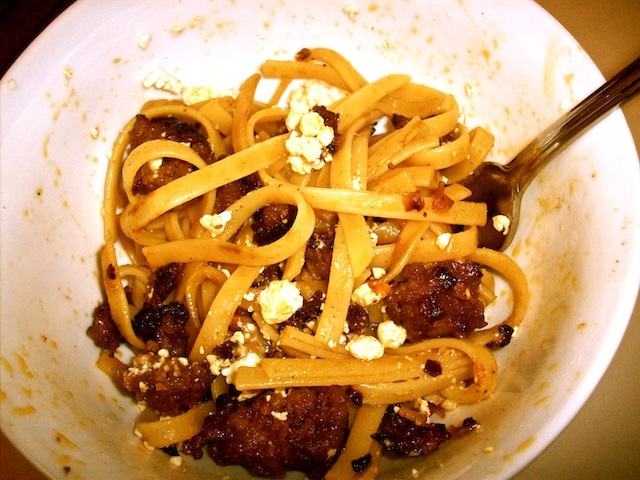 Briefly, A Method: Pasta with Hot Italian Sausage & Feta – Eat Me. Drink Me. I have to share this recipe, mostly because I was sure it was going to taste awful. It’s another child of the experimenting I’ve been doing with the leftover food in my pantry slash fridge slash freezer, and like the last fifteen things I’ve made, features feta cheese from the farmer’s market. It was delicious. A method for using up leftovers. Per package directions, boil as much pasta (or as many lonely strands left in the box) as you want. Remove skins from two hot Italian sausages (preferably ones that have been hiding in the back of your freezer for five months) and break up meat in skillet over medium-high heat. Add a few pearl onions (leftover from Spring Break when you sent boys to buy scallions), some berebere spice (a Christmas gift), cinnamon, brown sugar, and salt to taste. When the meat and pasta are both fully cooked, add the pasta to the skillet of sausage and drizzle some olive oil on top. Continue to sauté the pasta until coated with spice. Add some shredded parmesan cheese (but only from a mostly rock-solid block) for good measure, and toss until the cheese melts. Serve in a bowl and garnish generously with feta cheese. Make your roommate eating Easy Mac jealous. sounds delicious.. and i can only hope that my attempts to empty the freezer/fridge before i leave turn out half as good as yours.